Introducing the eco-friendly Cross Trek. 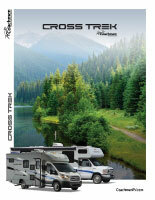 The Cross Trek's size and capabilities give you nearly endless possibilities. Take your adventure where most motorhomes cannot. With unrivaled exterior storage, you can outfit your Cross Trek with the gear and equipment needed to conquer any expedition. There are currently no Vitual Tours for this brand.